Just as orthodontics repositions the teeth, surgical orthodontics (also known as orthognathic surgery) corrects jaw irregularities in order to improve the patient´s ability to chew, speak, and breathe and for improved facial esthetics. In other words, surgical orthodontics straightens your jaw. Moving the jaws also moves the teeth, so braces are always performed in conjunction with jaw correction. This helps to ensure the teeth are in their proper position after surgery. If you need surgical orthodontics, your orthodontist will work with an oral and maxillofacial surgeon to ensure that you receive the best care possible. The need for surgical orthodontics occurs when the jaws do not line up correctly, and a proper bite cannot be achieved with orthodontic treatment alone. Depending on the severity of your case, your orthodontist can tell you if orthognathic surgery is needed as part of your treatment. In order to receive orthognathic surgery, the jaw must be done growing. Typically, jaw growth stops by age 16 in females and 18 in males. One to two years prior to surgery, orthodontic braces will be used to move the teeth into their proper position within the jaw and then orthognathic surgery will be performed to help the jaws align. As your teeth move with the braces, you may think that your bite is getting worse rather than better. However, when your jaws are placed into proper alignment during orthognathic surgery, the teeth will then fit into their proper positions. An oral and maxillofacial surgeon will perform your orthognathic surgery, and the surgery will take place in a hospital or outpatient clinic. Orthognathic surgery can take several hours depending on each individual case. Once the surgery is complete, you will have about a two-week rest period. Since orthognathic surgery is a major treatment, we recommend that you schedule some time away from work and school during the healing process. 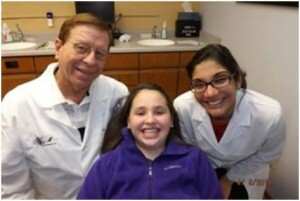 After your jaw has healed, you will continue to wear braces for an additional 6 to 12 months, allowing the orthodontist to “fine tune” your bite. After your braces are removed, you will wear a retainer to help maintain your new smile.